Khalsa Transport Ltd is a sub-contractor that transports tarmac for Tarmac industries. 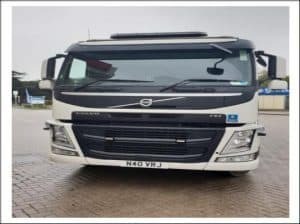 The company is run by the managing director Navraj Singh Cheema, who took over the family business in 1997, which has been established since 1984, before Navraj established Khalsa Transport Ltd in 2002. The company has seen the standard of safety increase within its business, with a continuous ZERO accidents and ZERO transport related fines since implementing the FORS standard. FORS was bought to our attention in 2015 by Tarmac Ltd, at first it bought us best practices in management of the business, training and best practises that now a lot of things you had to initially think about are much easier and automatic reactions. The management of any drivers employed, and responsibilities are clear making it easier for all to understand and adhere to. We passed our initial FORS Bronze audit with the help of the FORS e-learning driving modules. These modules helped with our driver knowledge of the road and extended it further with the increased knowledge of how to optimise our road safety methods. After seeing the success of completing these driver modules, we were encouraged to keep up to date with any new driving modules and chose to aim for a FORS Silver and Gold accreditation. Once we then became Silver and Gold accredited, we made good use of the FORS toolkits, in particular the performance manager toolkit which helped us keep track of our KMPL, so we could then see where we could make improvements in order to improve these figures in the following quarter. The toolkit was also useful when helping to organise our filing systems and implementing policies for our company. ‘Our company’s filing system is now more efficient and organised thanks to the FORS performance Management tool kit.’ – Navraj Singh Cheema, Managing Director. Expanding our drivers’ knowledge with the help of the FORS e-learning driving modules helped to make our drivers to be more confident on the road and has helped keep our accident and fines number to ZERO. We were particularly impressed with the FORS Truck Smart module as it was very informative on how to ensure your vehicle is safe for the road. Furthermore, the Staying Legal course helped ensure that our drivers follow the right regulations whilst on the road. 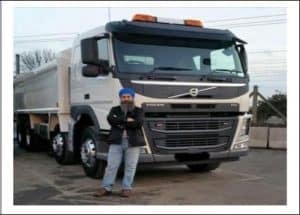 ‘Thanks to the FORS e-learning modules we are much safer and more confident on the road!’ – Navraj Singh Cheema, Managing Director. The reason for the progression from Bronze to Gold was to challenge our ability and to ensure that we run the company as professionally as possible and having the recognition of Gold on the fleet ensures that other hauliers and road users are also aware of our professional competence and commitment. A Khalsa Transport Ltd, we require drivers to prove that they are fit to work with a written doctor note, as we believe the health of our drivers must be at its peak to ensure the health and safety of our drivers and of the public and other road users. Also, in order to further ensure our drivers health is at its peak, we have put in place certain policies and require them to also fill out a health questionnaire before official employment. Drivers are employed usually through recommendation, having experience and passing the induction and full training programme. Drivers are made aware of the need to limit noise, especially at night they are briefed on this issue by means of a noise policy and noise risk assessments, vehicle is fitted with a night heater, further reducing the need for running the engine when stationary. All maintenance and washing are carried out off site, there is also a ‘keys out’ policy when the vehicle is stationary. Unfortunately, there is no alternative fuel vehicle on the market at the present time, that would meet our needs. Our vehicle is the very latest model a 2018 Euro6 that maximises fuel efficiency and cleaner for the environment. Khalsa Transport Ltd has a policy to update its fleet every three years to keep up with changing improvements and upgrades in vehicles for newer engines and fuel systems, our next panned change is in 2021. Being Gold shows the commitment of my company towards safe-standards and low-emission, this is a source of pride to have the Gold standard logo on my vehicle. This Gold Standard is also helping my company get more work contracts other than Tarmac Ltd.